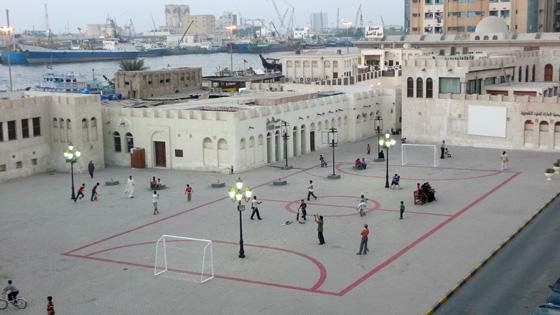 As part of the Sharjah Biennial, artist Maider López painted the lines of a soccer field red in a public square of Sharjah, adding goals on either end. Because pre-existing features such as benches and streetlamps were not altered, the square became a strange new site for football matches where spectators relaxed on benches inside the pitch at all hours. The project suggests a model for easy and relaxed integration of different activities. Maider López works on interrupting conventional space and architecture.